My dad, Walter Colby, is 93 and receiving hospice care. Every day as I was writing a newspaper article about trout stocking and fishing in Haverhill, MA, I’d tell my dad what I learned. He and I used to fish when I was very young and it was good to include his knowledgeable perspective. As part of my research, I contacted Mass Division of Fisheries and Wildlife to get some more info for my story. Marion Larson answered my questions, and my father’s and then connected me with John Sheedy. John was stocking a couple of rivers in Haverhill and I was invited to meet up to watch the process. John told me that they were stocking Haverhill’s Lake Saltonstall, Plug Pond as the locals call it, the following Tuesday. It was beyond the deadline for my article, but I asked if I could bring my dad with me to experience the process. There aren’t a lot of things my father loves more than fishing, though he hadn’t been in years. I was looking for something to bolster his spirits as his health declined. John promised to email me the estimated time of arrival as it got closer. I told my dad I’d take him to see the stocking at Plug Pond because it was a relatively flat shore and maybe we could sit in the car and watch. Shortly before we left, he asked if he would be able to try fishing. I wasn’t prepared for that request, he has difficulty moving, is legally blind and he’d given all his gear away years ago. I knew I couldn’t make it happen in that short a time, but I was very confident that the people of Haverhill could and would. I reached out first to a young man named Josh Penney who’s photography I admire on local Facebook pages, especially as it often included views from his local fishing expeditions. He is huge into fishing. Some call him the “Fishing Legend” of the city. East Brook River being stocked by John. We’d stopped on the busy street and released the fish off the bridge. As the time ticked away and I hadn’t heard back from Josh, I threw the request onto my Facebook page called ‘The Heartbeat of Haverhill’. Surely someone could help me there. I know from experience that the loveliest people read and comment, I just had no idea the extent of their kindness. Lake Saltonstall/Plug Pond provided an easier spot to view the fish release. Within hours, there were 5,000 views of my request. People were tagging friends that might be able to help; they offered possible solutions. It was a Facebook feeding frenzy of activity in an effort to help my father experience a joy he didn’t think he’d get to try again. Someone offered a Barbie fishing rod, people looked for rods in their basements though they didn’t know if the tackle was appropriate, one woman said she’d bring what she’d found but admitted she didn’t know what to do if we actually caught something, but she’d be there. Others offered fishing expeditions on other days. The offers of help were amazing, each bringing me closer to giving dad a chance to fish. And each bringing me closer to my very awesome community. Then I heard back from Josh Penney, he was on his way. I wrote back on Facebook that I was all set and left to pick up my father. Josh is 17, a home schooled student who changed his study schedule so he could be there. He filled a backpack with tackle and rods and rode his bike across the city to meet us. We’d never met or spoken except through social media. John lets dad check out the trout before releasing them, OR….. this is a net full of the fish dad caught…yah I like that story better. My dad and I sat in a parking space overlooking the lake at a point where I guessed they would unload the fish. My father positioned in his wheelchair between my car and a truck to shield against the wind was wrapped in a windproof picnic blanket and an odd coat or two I’d brought to keep him warm. We waited for both Josh, and John with his truck tanks full of trout. A very well dressed man pulled in behind us. 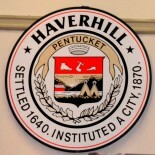 He stepped out of his truck in his beautifully polished dress shoes and asked “Are you The Heartbeat of Haverhill? Have you caught anything yet?” I recognized Constable Gerald Sewell. I said we hadn’t fished yet. He introduced us to his friend Brian Joyce. He was probably confused as to the lack of fishing, but I didn’t know if it was alright to let the public know about the trout being delivered, so I pretended we were content just sitting. Brian, Gerry and my father engaged in an animated discussion on lures, and fish and strategies and every other topics old fishing buddies and retired military veterans might share. I watched my father shift from tired to excited through their conversations. Dad may have aimed for the spot where this very successful trout fisher whose name we didn’t catch (on left) was reeling them in. Dad, Brian and Josh. Then Josh showed up and started piecing together his rod. Josh is an avid bass angler, but he brought whatever tackle he guessed trout might like. My father instructed him on the advantages of the spoon shaped metal goldfish lure that he’d used in his day. Josh listened and tried to find the nearest proximity. Several cars pulled into the surrounding parking spaces, a passenger called out “we are here for the same thing.” I assumed someone told them about the trout truck, though my lips had been sealed. I was so focused on my father that it didn’t occur to me that the other cars were there as back up support. They’d ignored my “all set” comment and came to provide any help or gear that might be needed. Are you kidding me! How wonderful are these people of Haverhill? How can I ever repay the kindness from an entire City, and an entire Division of Fisheries and Wildlife. Josh shows why he’s considered a fishing legend at 17. What’s a fish without a picture! Josh released the fish after this photo opp. The trout truck pulled into the lot with 400 browns and brooks ready to explore life outside the tanks of the breeding farms. John and his co-worker also named Josh patiently waited to start releasing the fish as I tried to maneuver the wheelchair across the soft damp ground. Guys in the vicinity jumped up to help me move his chair. John brought net after net filled with fish for my father to inspect and even attempt to hand catch. They were so patient when I wanted a photo that could be misrepresented as a net full of my father’s catches. Strangers held his chair in place on the sloping lake shore so I could take pictures. The trout truck left, and Josh started attaching lures. The wind was really carrying the line, though Josh had a way of whipping the rod at a high speed that allowed his cast to land true. At first, my father was content to watch despite his limited vision, offering advice as needed. Gerry called Josh aside to reveal a treasure trove of fishing gear that he offered Josh. It was like fishing with family. We moved my father to the boat ramp for stability and he took a few casts with a few nibbles but no catches. Josh cast the line and offered to let my father reel it in. Nope, my dad was not taking credit for another man’s cast. Gerald starting fishing and it was experience versus youth. And in the short time we had before Josh had to return to his studies, and dad wanted to get back to the warmth of the car, Josh reeled in a trout retaining his fishing legend status, but not before lots of laughs and good natured ribbing and challenges. Consider this – after weeks with no appetite, my dad wanted to go out for lunch, and he wanted a lottery ticket to see if his amazing luck included Power Ball. Over lunch my father said “Al, you know if I win this lottery, how great will it be for me to buy 400 more trout for the fish and wildlife people so that many more people could enjoy a day like today.” I’ve never wanted someone to win a lottery more, though I pretty much felt we’d already won. Thank you to everyone who made this possible. Me and Dad a few days later. My father passed away four weeks after our fishing trip, on Memorial Day. I think he would like being remembered on a day that celebrates veterans that is also a day when families gather together to kick off the promise of a summer full of outdoor adventures. I miss him more on each beautiful day. That’s a wonderful tribute to your dad and the city. Thank you again for sharing it with us. this City is built on the backs of some pretty awesome people, young and old. I am so very fortunate to have had them help me out like that. I wrote this about Haverhill, MA the City that made a huge impact on my dad’s last days. It was originally posted on my blog The Heartbeat of Haverhill. But the sentiment is universal so I am sharing it here. To expand the number of people who get to hear of my gratitude. This City can be such a blessing. This entry was posted on August 15, 2018 by Brain4Rent/THoH in #HaverhillHelps dad fish, #Kindness, Fishing In Haverhill MA, Fresh water fishing in Haverhill, Haverhill Massachusetts, Haverhill Parks and Recreation, Kindness of Strangers, Mass Fisheries and Wildlife, trout stocking in Haverhill, Uncategorized and tagged #HaverhillHelps, #thisisHaverhill, Alison Colby-Campbell, Brian Joyce, Constable Gerald Sewell, Haverhill MA, Josh Penney, Mass Fisheries and Wildlife, Nature, photography, Plug Pond Lake Saltonstall, TheHeartbeatofHaverhill, trout stocking in Haverhill.